Celebrations are moments of joy and permission for families. Children take part in the festivity by imitating their parents with their own things and enjoying more freedom. The party is on, but for parents it is a challenge to let their children be free while ensuring these moments remain healthy. Champomy is the perfect drink for them! Champomy is a “champagne” for kids: the bottle looks the same, you hear the popping sound when you open it, but what you drink is an incredibly natural and alcohol-free sparkling apple juice. 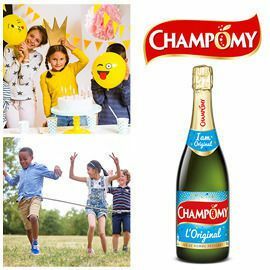 Champomy was launched in the 90s in France and since that date it has become an icon of kids’ parties. The brand is strongly anchored in a whole generation of French who consumed the product and started buying it for their kids and even grandchildren. However, despite this heritage, the brand has seen its popularity decrease among the new generation. Champomy needs your creativity to revamp its bottle look to connect with a new generation and spark festive moments for families!